You've done all the research, weighed all the options, and finally decided to make the jump. You're ready to invest in nonprofit fundraising software. Now, the only thing standing between you and more successful fundraising efforts is having to convince your board. As a staff member, you know exactly how the software will help your organization. Your board, on the other hand, might be harder to convince. It's understandable that board members might have some hesitations. Software, after all, is an investment, and they don't want to run the risk that they'll make a decision that negatively impacts the organization. So, the big question is: how do you convince your board to make the purchase? Ask your vendor of choice for help. With a little bit of preparation, you're sure to make a pitch they can't refuse. The key to making any kind of sale is to show the buyer all of the good things a product can do for them. In this case, your goal is to show the board all the ways that fundraising software will benefit your organization. Although it might seem obvious to accentuate the good, this step requires a little thought. Because some benefits might be a little less immediate or direct, it's easy to overlook them when first coming to your decision. To have the most convincing pitch possible, you want to cover all of the advantages to show your board how they're getting the most out of their money. Raising more money for your cause. Reducing the costs of your fundraising efforts. Opening up more staff hours by reducing manual maintenance tasks. Requiring fewer staff or volunteer hours in general through automation. Creating deeper and more valuable donor relationships. Leaving less room for error. Think about what's important to your board and frame the advantages in a way that would be favorable to them. They're passionate about improving your organization as well, so let them know how this purchase will help them do that. How much is this going to cost the organization? It's important to be as objective and transparent as possible when pitching software to your board, and that means being honest about the costs. If you slant your pitch too favorably, it might come across as disingenuous, and you run the risk that your board might mistrust you. You don't want anyone to be put off from making the purchase altogether. How much time and money it will cost to train staff on the new software. How much it will cost to update the software as technology evolves. How much it will cost to incorporate new modules as your organization expands. If there are costs associated with online donation processing. Let your board know exactly how much they'll be spending both now and in the future. They'll be more confident in making the purchase, and you'll both be relieved when there are no unexpected expenses lurking down the line. 3. Create a compelling presentation. If you're pitching the purchase in person, keep your audience engaged by incorporating a visual presentation. If done right, a visual presentation can make your argument much more effective. It helps you organize your information so you'll stay on track and be sure not to miss any important points. A slideshow can also help your board visualize the benefits and understand all of the information. Focus on one point per slide. Keep text to a minimum. Use lots of images, but only if they're relevant. Keep data simple and straightforward. Your presentation shouldn't be the whole of your pitch, so avoid the temptation to pack it with information and read straight off of the slides. Instead, it should act as a sort of guide that enhances your pitch for your board and helps you transition smoothly from point to point. If you're pitching your software over the phone, you can still get reap the benefits of a presentation by screensharing with your board. Or, if you just need a guide, you can create a written outline to consult during the conversation. Especially when it comes to something as technical and intricate as software, your board is bound to have questions. When considering a purchase, they're going to want the answers. Make sure you have the answers ready by anticipating the questions. When you're done making your presentation, read through it one more time. Ask yourself: If I were a board member, what questions would I have after listening to this presentation? It's impossible to cover all of the important information about software in one short pitch, so your presentation is going to leave questions. Try to think up all the possible things your board is likely to ask about. The purpose and features of each module. How the software integrates with your existing platforms. The effects the software will have on day-to-day operations. What type of training will be required to use the system. How much technical know-how is needed. How the software will grow with your nonprofit over time. Once you have your questions, you can start preparing the answers and, if needed, doing additional research. The more prepared you are, the more authoritative your pitch will be, and the more likely you are to sway your board. Before making the actual pitch, it can be helpful to practice it in front of individual board members first. It will be easier to cater your pitch to individuals and try to convince them before you take on the bigger challenge of pitching to the entire board. Set aside time to talk one-on-one with a couple of board members before the next meeting and give them your spiel. Try to seek out some of the more influential members. Their approval is more likely to help you convince the rest of the board. Plus, since your board will be your audience, members will be your best critics. Blind spots in your pitch that might need improvement. What board members' primary concerns might be. Any questions members might ask. Areas where you might need to do further research. If your idea is well founded or needs significant reworking. Ultimately, pitching to individual members first will help you decide if you're ready to give your presentation or if it needs to be tabled until you work out all of the kinks. Either way, when it's time to give the pitch, you'll be prepared. The saying is true: there really is strength in numbers. If more than one person recommends purchasing fundraising software, your board is more likely to be convinced. They're especially likely to be convinced if that recommendation comes from one of their own. 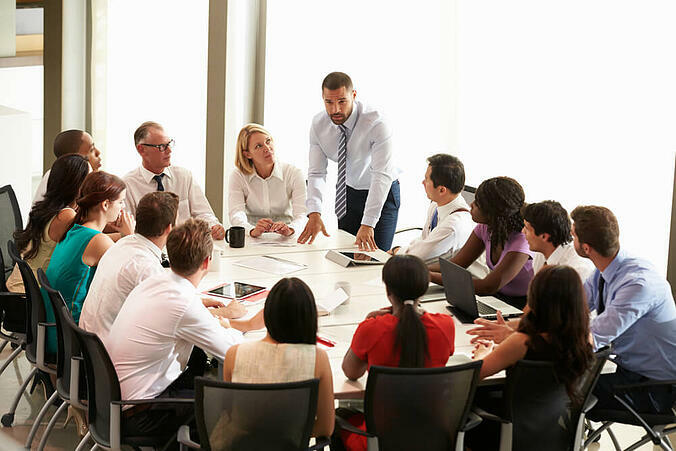 If you find that one of the board members responds particularly favorably to your pitch when you give it to them one-on-one, see if they'll agree to be your advocate. During the presentation they can help you make your points and answer any questions the other board members might have. When board members see someone they respect and trust supporting the decision to buy software, they're sure to follow suit. 7. Ask your vendor of choice for help. No one knows the ins and outs of your software better than the vendor you're buying it from. When it comes to your pitch, don't be afraid to ask them for help! If you need a little advice on how to make your pitch more compelling, most vendors have resources they can provide clients with that include information to help them prepare for the pitch and decide how to approach it in the way that's most compelling to the board. They also generally include data that will help you convince your board of software's efficacy, including statistics and case studies demonstrating how the product has worked for other organizations in the past. There's really nothing more telling than cold hard data. If you show your board quantifiable results, they're more likely to make the purchase. You'll never know unless you ask. See what your vendor can do for you. Although pitching software may seem daunting at first, at the end of the day, it's important to remember that your board is on your side. Like you, they want to see the organization progress and will be happy about a potential opportunity to do that. The main goal of your pitch is to provide board members with all the information they need to make a sound decision. If you've done all the research and have chosen the right software for your organization, there's no reason why they shouldn't back you up.